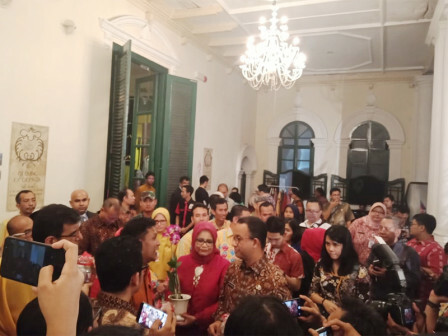 Jakarta Governor, Anies Baswedan opens Asian Textiles Exhibition at Textile Museum, Tanah Abang, Central Jakarta.
" This exhibition becomes a part of cultural expression that is always developing"
This exhibition has a theme "Share Roots, Divers Growth Celebrating Asia's Textile Traditions" and attended by Jakarta TP PKK Head, Fery Farhati. He said, he supports this exhibition which is held in order to welcome Asian Games XVIII. "I appreciate the craftsmen, collectors, and textile lovers from Asia, especially Indonesia," he expressed, Thursday (8/9) night. He added, artworks which are showed in exhibition is not only show the creativity in past, but also can be an inspiration to create new innovation related with textile. "This exhibition becomes a part of cultural expression that is always developing," he added. Meanwhile, Perkumpulan Wastra Indonesia Leader, Bhimanto Suwastoyo conveyed, there are various types of textile in Indonesia and other countries in Asia. "We can learn many things from textile culture and development in each regions," he stated.